The next time around, I will add caramelized onions, roasted capsicum and toasted pumpkin seeds for some crunch. You can go with endless add-ins including left overs while making a quick sandwich. 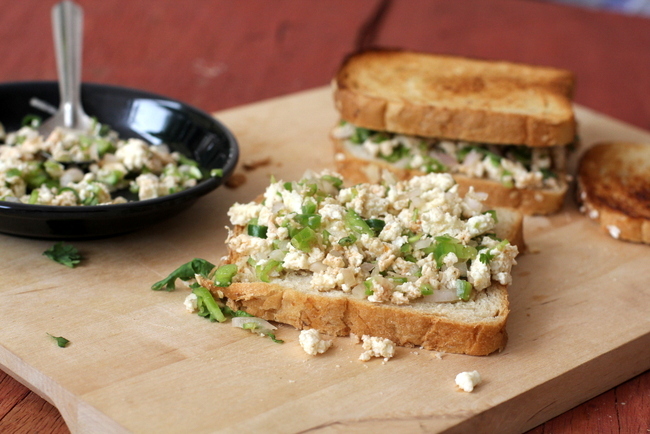 If you do not have paneer on hand, use hung yogurt which makes for a lovely spread over sandwiches. Use whole wheat bread or brown bread. 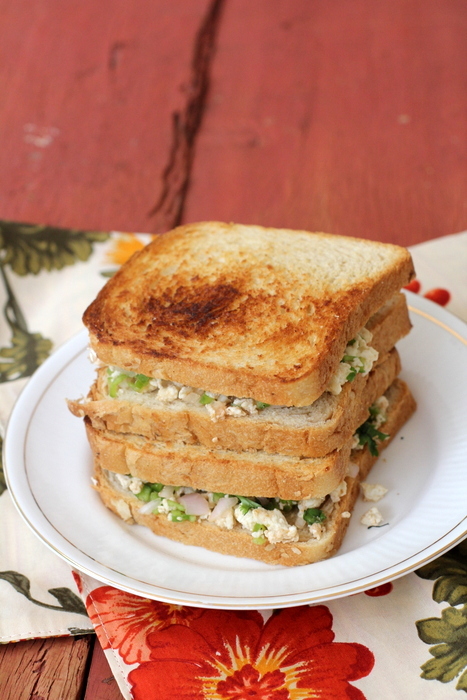 Paneer Sandwich can be served as an open faced sandwich too. In a bowl, mix all the ingredients except butter and bread. 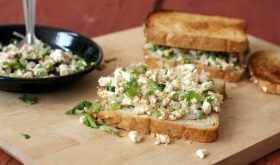 Take 2 tablespoons of the prepared paneer filling and place on the whole wheat bread slice. Place another bread slice over it. Drizzle some butter on a pan and toast the sandwich. Alternately, you can grill the sandwich too. In that case, spread a little butter on one side of each bread slice and place filling on the un-buttered and grill it. Serve warm. If you do not have paneer on hand, use tofu or hung yogurt. Use any colored bell peppers. Add a pinch of garam masala for variation in flavor. By Sailu Published: August 8, 2012 Paneer Sandwich that makes for a healthy vegetarian sandwich recipe for kids. Pack your kids lunch box or serve as a healthy breakfast or a quick evening snack. I have followed the sandwich recipes in your previous blogs and I’m really glad you shared another interesting sandwich recipe. Will these recipes work for vegetarians like me? It’s a very fast recipe and also healthy. I have suggest one thing a brown bread use in recipe because it’s a healthy. This is a very good recipe.And is very very heavy, like a meal. Thanks Sailu. quick and healthy snack for kiddos. U mentioned about pumpkin seeds. Any idea where we can get them in Hyderabad? hai sailu I love ur receipes. I tried many items n they came out very well. I got more appreciations from my family. thank u.